Electronic Kit School. - Maybe sometime we need 3.3V battery to supply our electronic device with low current, but we also difficult to find this battery to buy. In the market rechargeable battery like alkaline usually sell with voltage 1.2V or 1.5V a cell. So, in here we need boost converter to boost 1.2V or 1.5V cell battery to 3.3V for this work. 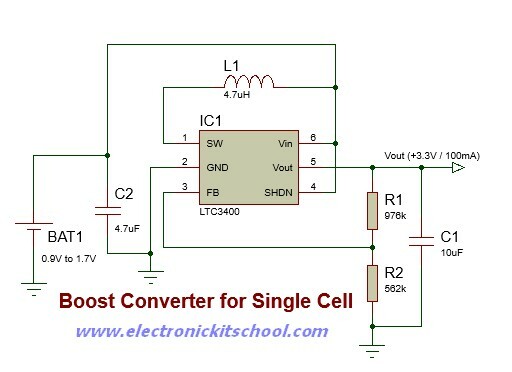 In this article we will show you one electronic circuit that will give you booster converter that can convert step-up voltage from 0.9V/1.7V in single cell to 3.3V/100mA output like in Figure 1 below. Circuit like in Figure 1 above show you about the 0.9V/1.7V Single Cell to 3.3V/100mA Boost Converter Circuit using LTC3400 IC. From this circuit we can produce 3.3V/100mA output from single cell battery with voltage input ranged from 0.9V to 1.7V. The main component is used in this circuit is LTC3400 as the DC to DC boost converter. In here, we need to connect the SHDN pin to Vin through a 1MΩ pull-up resistor. As you can see is pretty simple to have a 3.3-Volt power source that cost around $2 if you use with the LTC3400 IC.